Seasonal demand for outgoing travel market seems to be somewhat subdued. The number of inquiries with overseas tour operators sharply decreased starting in the third week of July and showed no sign of rebound, according to travel trade sources. The seasonal market started stronger but started to lose steam from July 18 visibly against the backdrop of such a bad news as unilateral cancellation of Phuket Airline's chartered flight to Phuket and strike of Asiana Airlines' unionized pilots grounding all domestic routes plus part of international flights both of which came at the height of the vacation season. For lack of new demand for overseas trip, major tour operators have started reducing frequencies of newspaper advertisement at a time when such a media promotional campaigns are badly needed. Red Cap, Tour2000, and Good Morning Travel, for instance, have withdrawn earlier plan to increase frequencies of newspaper advertisement. "We are closely watching market development and plan to increase advertisement campaign sometime after August 15," said a marketing executive. Some travel agents are considering more aggressive marketing campaign to attract clients this and next week to sell off remaining passenger seats on chartered flights. "If necessary, we have no choice but to resort to price-cut tactics," said a tour operator with unsold hard bloc charter seats. Demand for FIT tour products is likely to surge with five days a week system are being introduced at most of work places nationwide making it the priority segment in local market. Until last year, the ratio of FIT and package tour stood at 6 to 4 in favor of the former but the ratio now is 8 to 2 with package tour market dwindling rapidly, according to a marketing executive at Nextour which is developing new branding FIT products based on themes of tour. He pointed out those young people prefer to travel in a more flexible way and plan their own itineraries against the backdrop of a five-day working week now widely implemented at major work places in South Korea. With weekend travel is becoming popular among FIT travelers. we can provide a new travel products tailored for these travelers by this coming September, Next our executive added. Another online tour operator Tourexpress (www.tourexpress.com) also jumps on bandwagon of FIT market and plans to come out with new travel products by early September..
Phuket Airlines waning credibility deals blow to Thai tourism Aftermath of Phuket Airlines' s unilateral decision to cancel flights it planned to operate between Incheon International Airport and Phuket days before the official launch of the service is still lingering. As of now, most of 5,000 travelers affected by the cancellation of the flight during the summer holiday season have their tickets refunded or rescheduled with other carriers. Freedom Travel also took measures to find other carriers as replacements for those customers who bought Phuket Airlines tickets. 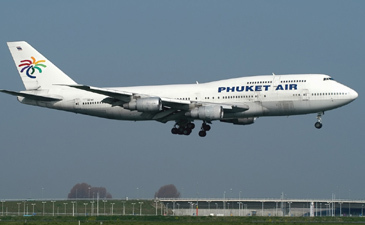 Complaints about Phuket Airlines are having spillover effect on Phuket Airlines' regular flights on Incheon-Bangkok route. More recently, passengers of Phuket Airlines flights on Incheon-Bangkok route saw departure time of their flights delayed for hours more than three times in a couple of weeks. Phuket Airlines Seoul office has since been flooded with calls from some angry 5,000 people with flights booked for Phuket. 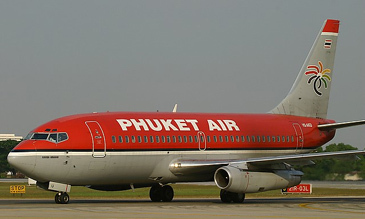 The tarnished image of Phuket Airlines will not likely to be improved for the time being.